Isolkenaf Pav is the right product to thermal insulate and to soundproof floors, and especially is the right product to insulate against impact sound transmission through the floors of a building. 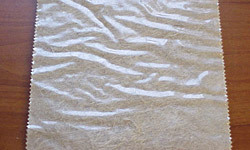 Isolkenaf Pav has a low elastic modulus, it is therefore highly flexible and elastic with an extremely strong mechanical structure; these three characteristics make Isolkenaf Pav able to dampen the kinetic energy of mechanical vibration transmitted through the floors in houses and other kind of buildings. Isolkenaf Pav is one of the products with the best floors soundproofing performance on the market, at an advantageous price because it is obtained by the innovative technology of recycling polyester fibers and miscellaneous fabrics. Isolkenaf Pav is produced in full observance of the principle of green building. Isolkenaf Pav is used in every kind of floor slab made of concrete and brick, concrete, wood. Its floors soundproofing performance is maintained over the years because its structure features high mechanical strength and its elasticity remains constant over time even when there are high static and dynamic loads (gyms, shopping malls, etc). Isolkenaf Pav is easy to work, it can be cut with a normal cutter and releases no fiber or dust. Its is also fit for use in rooms where there is a vital requirement for a non-toxic product that is not dusty, above all when it is laid under a floating floor that can be inspected. The above data for Isolkenaf Pav floors soundproofing rolls are given in good faith and refer to values obtained from samples of current productions. We reserve the right to modify the technical characteristics or update the data without notice following developments in technology and/or our experience.